We meet Moc on a warm July morning, sitting on a bench outside the Talbot Hotel in Tregaron. This is where his fishing career started over 50 years ago – the young Moc got paid threepence a time for pulling the gentry’s waders off. His own fishing has come a long way since then. Moc has managed the Welsh fly fishing team for the past 20 years, regularly presented programmes for local radio and television, and written several books and countless articles. 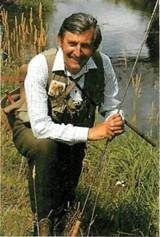 As a youngster, Moc spent a good deal of his time chasing rabbits, ferreting, shooting – and fishing of course. He regrets that there are not as many youngsters coming into the sport these days but he tries to encourage them by giving lectures in schools. Moc wades cautiously upstream, casting to the fast water under the bridge. In low, clear conditions like these, it is important that the first cast does not splash down on the water or else it may put the fish off for the rest of the day. Moc rubs the the last 30cm (12in) of his to make it sink. Magnifying, bi-focal polaroids help him to see beneath the water surface and to tie flies. 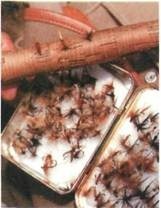 Greys and browns seem to score well on the Teifi – the Sunfly, the Partridge series, Grey Duster, Dan’s Supreme, Dog’s Body, Hare’s Ear nymph and Pheasant Tail nymph are all worth a try. There’s a six fish limit on this stretch but you don’t have to take everything you catch. 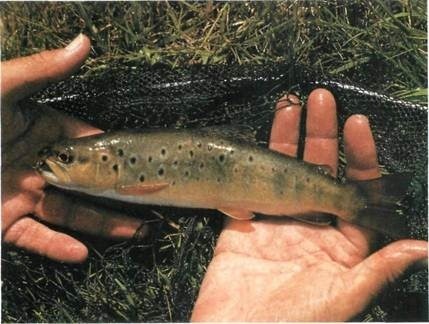 A quick twist of the hook and freedom is restored to a small Teifi brown trout. 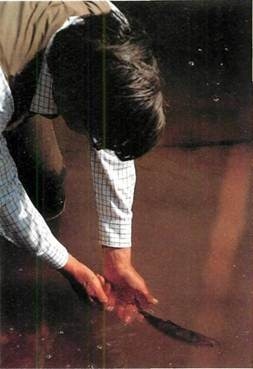 This is a conservation point -releasing a fish while it is still in the water reduces stress on the fish and improves the chances of it growing to specimen size. Llanio Isaf is situated three miles south-west of Tregaron in north-east Dyfed. By car From the M4 join the A483 at junction 49. 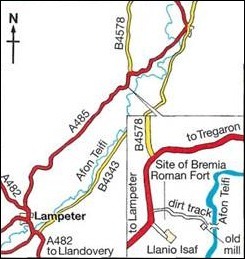 Pass through Ammanford to Llandeilo. At Llandeilo join the A40 to Llandovery. About four miles before Llandovery turn left on to the A482 to Lampeter. 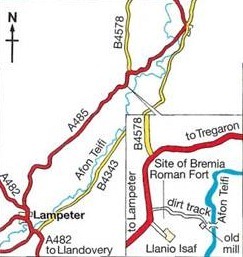 At Lampeter, take a right turn on to the A485 to Tregaron. Just before the B4578-about three miles before Tregaron – turn right down a track to the mill. When the river is low, Moc expects to find fish in the fast, well-oxygenated water. 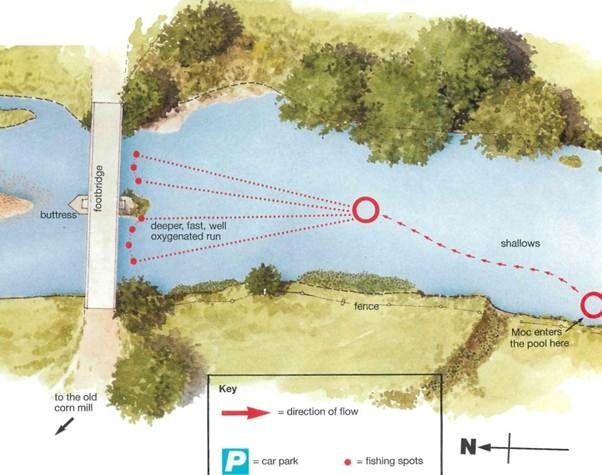 Here on Deep Pool he casts his fly to the head of the pool, and lets it ride towards him on the water that passes under the overhanging right-hand bank. Moc nets a half-pounder from ‘The Pool where You Lose Your Hooks’. Water abstraction has led to a decline in fishing on the Teifi – the fish are fewer and smaller than they used to be and a half-pounder is above average. When casting, wading can give you a great advantage in reaching the fish, but it has to be done with care. Beware of strong currents, shelves and deep holes. 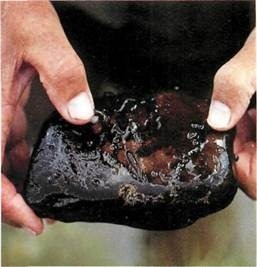 Rocks can be slippery so make sure the soles of your waders are suitable. The name ‘brown trout’ doesn’t do these fish justice – they have bright red spots, a beautiful golden hue and perfect fins. Moc releases the half-pounder into ‘The Pool Where You Lose Your Hooks’. A fish’s colouring helps it to blend in with its environment. A pair of polaroids helps you spot the fish and protects your eyes from the hook when casting. Moc turns over a stone to reveal caddis, snails and leeches. Apart from making the fish difficult to catch, the hot weather has a lasting effect on the trout’s foodstocks, drying the stones out and killing the insect life. 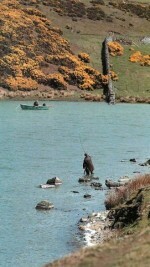 Many anglers make the mistake of wading carelessly – treading clumsily, knocking stones together and splashing about. This scares the fish. Moc aptly describes the way in which he wades as if ‘treading on eggs’. When the going’s tough the tough get going – Moc sets to work sidecasting his fly under the trees in a last ditch attempt to extract a fish. He made it look terribly easy, but in fact it’s taken him years to perfect his casting. 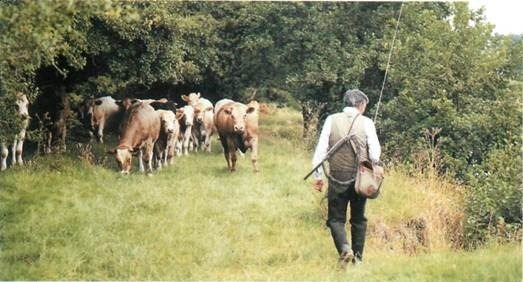 Confrontation – Moc encounters an inquisitive herd of Charolais bullocks on his way back to the bridge pool. He didn’t have any trouble though, they soon heeded the ex-headmaster’s order for them to clear the path. 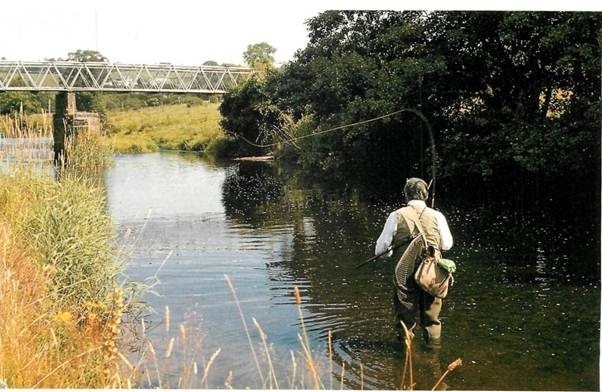 Back on the bridge pool Moc wades well upstream, casts right under the bridge and hooks into a much better fish. In a perfect world the fish would have stayed on the hook, but then who would want to go fishing in a perfect world? An overgrown track winds past the site of a Roman fort to the stretch of river that Moc has chosen. Close to the river there’s a disused corn mill. The remains of the water wheel can still be seen but the bed of the mill race is almost dry with the prolonged hot weather. It’s a tranquil spot, and when Moc’s not busy representing angling interests, he’s often to be found here after the Teifi brown trout. Moc’s attitude towards his tackle appears to be rather casual. This is not to say he doesn’t think it’s important – he is very particular in his choice of leader and fly. It is just that where he could spend all day praising the Teifi’s beauty and talking about the characters who have fished it, he couldn’t do the same for rods and reels. The rod is a rather battered, graphite, nine footer (2.7m), rated AFTMA no.6-8 – relatively cheap so that it doesn’t matter if it gets knocked about. The line is Airflo no.6, double tapered floater – ‘you can leave it for months and it wears well,’ says Moc. Teifi, you shouldn’t have the leader too long-’or else you have to stand down in the tidal section to cast,’ says Moc. One of 11- 12ft (3.3-3.6m) is about right. 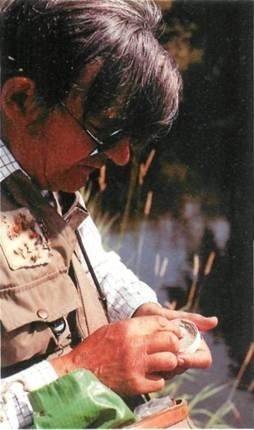 The flies Moc is able to tie his flies on the bank without a vice – a considerable feat -but then his mentor, the late Dai Lewis, was one of the best. ‘He could tie six in the time it took for a kettle to boil,’ says Moc. Tying on the bank is useful. In May, for example, there might be a sudden midday hatch of Grannom fly. These can vary in tone. Moc mightn’t have just the right pattern in his box but he is able to tie a fly to suggest one. For Moc, ‘suggestion’ is the secret to good fly tying: ‘you can’t copy what God made but you can suggest it – put life into a fly.’ He believes that when dressing a fly you should be honest with the integrity of detail. ‘If it is supposed to be a Sunfly, for example, then it should look like one, otherwise call it a variant,’ he says. The long hot summer has atrophied the Queen of Welsh rivers but she still looks beautiful. Circles and splashes on the surface that would normally indicate the presence of trout are absent, and there are no insects floating down. In these conditions Moc expects to find fish in the fast, well-oxygenated run under the ivy-covered bridge rather than in the slack water under the alders on the far side. 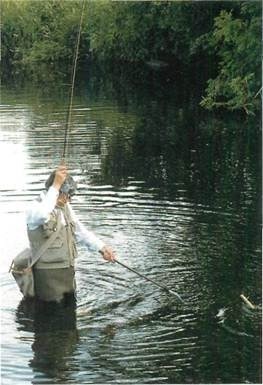 He stresses the importance of entering the pool in the correct place – well downstream of the fish. In low clear conditions fish are easily scared: ‘once they go under the weed they can stay there all day,’ says Moc as he wades gingerly upstream. He’s opted for a ‘cocktail’ – a Hare’s Ear nymph on the dropper and a Sunfly on the point. The Sunny is one of Moc’s favourites. It was created by Dai Lewis, the man who bought Moc his first licence. He was a great exponent of the art and a guru during the 30s and 40s. ‘Dai raised a family from the fish he caught on this river,’ says Moc. Moc’s cast drops slightly to the right of the buttress where he can see a couple of nice fish moving. ‘The first cast is so important, you can scare the whole lot with a bad cast.’ He lets the flies ride back towards him for about 10 seconds and then recasts slightly to the right of the first cast. Suddenly his rod springs to life as a small, wild brownie snaps up the nymph. It gives a fine display of acrobatics as Moc brings it in. Moc reaches forward and releases the fish with one hand while it is still in the water. Moc rests the pool for a few minutes. He’s going to try the water in front of the bridge to the left of the buttress. A casting machine could not improve on Moc’s precision. 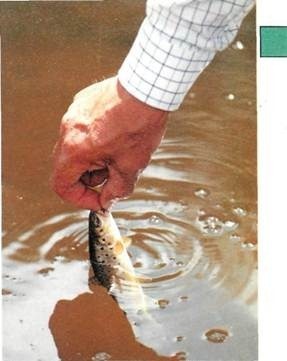 His technique enables him to put a fly to within 15cm (6in) of the target, and in doing so he can reach the fish that the other anglers can’t. The movement is solely in his elbow, which he pivots in the vertical plane. Moc likens it to knocking in a nail with a hammer. He casts, casts and recasts. ‘The trick is to get the fly to ride the water naturally – there must be no drag.’ Ironically, it is just as he is straightening out his cast and effectively dragging the Sunny that a beautifully marked half-pounder takes a fancy to it. It really is too hot to fish. Things have gone quiet on the bridge pool so Moc moves downstream to Pwll Dwfn (Deep Pool). On days like this it is best to try likely areas rather than tracking down individual fish which are few and far between. 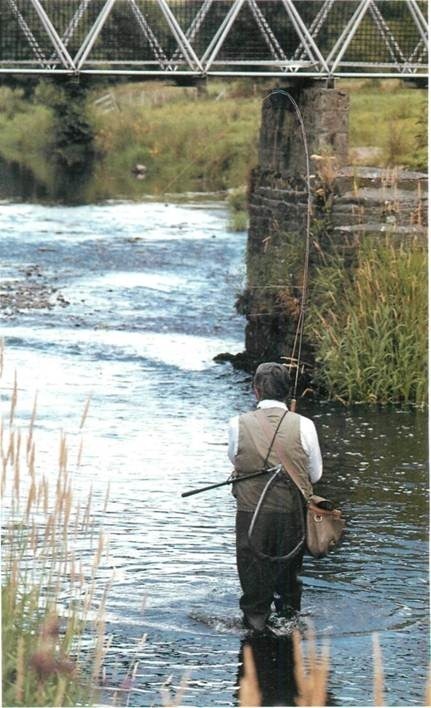 Moc wades into the slack water and slowly works his way upstream, casting his dry Partridge and nymph into the fast water at the head of the pool. High above him in the clear blue sky, a buzzard spirals upwards on the thermals. The Teifi trout, on the other hand, are not rising and Moc is soon on the move again. As Moc approaches ‘The Pool Where You Lose Your Hooks’ a fish rises in the dark water under the shade of an ash. The water is deeper here – maybe 3-4ft (90cm-1.2m) – and it flows lazily under the trees before disappearing round a bend. 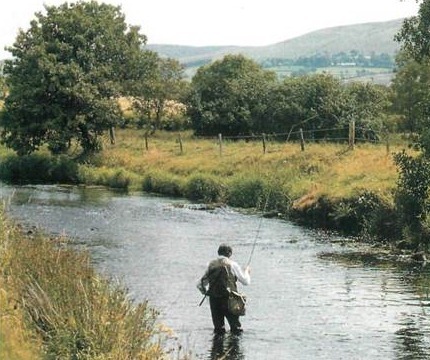 Moc recalls a time when he and George Noakes – the Archbishop of Wales – fished the pool one evening. ‘George took two 2lb (0.9kg) fish in as many casts.’ Moc is convinced that George had influence somewhere in high quarters. It looks as though the pool might live up to its name – a fence behind Moc makes casting awkward but in spite of this he manages to cast low, with great accuracy, projecting his weighted Claret nymph and Sunny right under the trees. 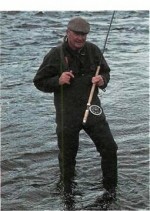 A better fish takes the nymph and sets the rod bucking. Moc is soon drawing a handsome 12oz (0.34kg) brownie over the rim of the net. He unhooks it and returns it gently to the water. ‘Perhaps he’ll send his father up,’ says Moc. In 1987 Jimmy Carter, one-time president of the USA, and his wife Rosehne spent six days on the Teifi. During their stay Jimmy caught 45 trout and returned them all. The pool where he fished became known as ‘Jimmy’s pool’. Willows fringe the far bank of the long, deepish stretch. ‘In August and September you can take salmon on a lightly dressed fly,’ says Moc. Rather than fishing the smooth water under the trees, he casts into the broken water at the head of the pool and almost immediately misses a lightning take. Moc walks upstream, slotting the fly expertly in among the trees, exploring the dappled water beneath. He works the fly into runs scoured deep by the current – but to no avail. Surely these fish are so unruly that not even an ex President – let alone a retired headmaster – could get them to cooperate? Moc traverses a narrow plank over a deep, dry ditch. He passes the deer park on his way back to the bridge pool. It’s much too hot for all this walking – especially in waders -but he’s going to give the bridge pool one last try. He casts, casts and recasts. The rod acts like a spring, projecting the fly upstream and turning the leader over just at the right moment, so that the fly lands lightly in the shadows under the bridge. 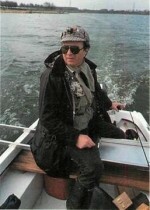 Angling is very much the sort of sport that has a knack of making those who practise it eat their own words, and no sooner has Moc admitted that the small fish are in all the places where he’d expect the big ones to be, than he hooks into a much bigger fish. He coaxes it from under the bridge and into the open water. ‘Ah well, never mind,’ is an approximation of what he says as the hook pulls free. It has been a hard day, with few fish to show for all the effort, but the colour and liveliness of those Tein trout and the sheer beauty of the river and the surroundings are ample compensation.